Plush velvet sleeve which adds value to any pen presentation. Colours: Black. Dimension: L 159mm x W 36mm x H 1 mm. Print Description: Cannot be branded. Print Type: . Packing: Loose packed. Description: Made from top grade nappa leather. 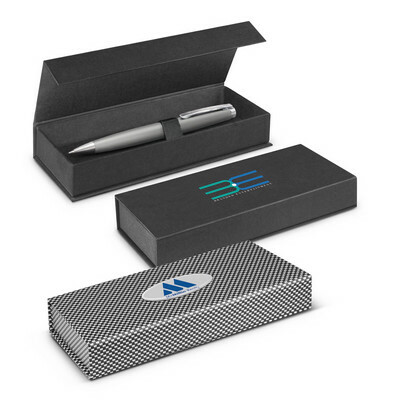 Features: Add your favourite pen and pencil for the complete presentation. Packaging: Poly Bag. Colour: Black. Material: Leather. Product Size: 165mm(w) x 50mm(h) x 20mm(d). Decoration: Pad Print, Emboss, engrave, foil. Decoration Area: Pad/Emboss: 30mm(w) x 30mm(h). 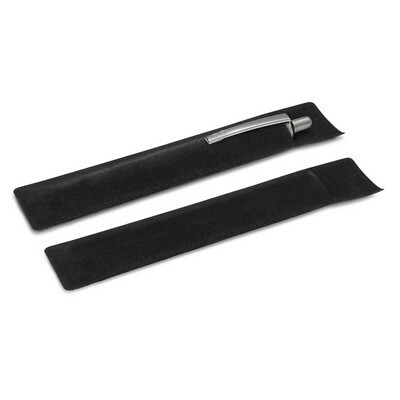 Description: Deluxe double pen box in black with classic silk lining. Features: Pad Print only. Packaging: Folded black tuck box. Packaging Size: 197mm(h) x 84mm(w) x 35mm(d). Colour: Black. Material: Thick cardboard box with silk lining. Product Size: 195mm(w) x 80mm(h). Decoration: Pad Print. Decoration Area: Pad: 80mm(w) x 40mm(h). Description: Black double pen box. Features: Shiny silver metal badge. Badge size 40mm(w) x 9mm(h). Packaging: Plain white tuck box. Packaging Size: 195mm(h) x 85mm(w) x 35mm(d). Colour: Black. Material: Leather look material metal badge. Product Size: 188mm(w) x 85mm(h) x 30mm(d). Decoration: Pad Print, Screen Print, Engrave. Decoration Area: On Badge - Laser: 28mm(w) x 7mm(h), Pad: 30mm(w) x 7mm(h), Screen - On Box: 60mm(w) x 30mm(h). Description: Deluxe leather look single pen box with padded internal cushion with a metal badge on the lid. Features: Packaging: White paper sleeve. Packaging Size: 175mm(h) x 60mm(w) x 33mm(d). Colour: Black. Material: Deluxe leather look. Product Size: 173mm(h) x 58mm(w) x 32mm(d). Decoration: Pad Print, Engrave. Decoration Area: Pad - On Box: 60mm(w) x 30mm(h), Laser - On Badge: 12mm(w) x 6mm(h). Description: Very popular and well priced velvet pouch with drawstring. Features: Suitable for all types of pens. Colour: Black. Material: Velvet. Product Size: 165mm(w) x 40mm(h). Decoration: Screen Print. Decoration Area: Screen: 130mm(h) x 25mm(w). Other Methods: Contact your decorator for applicability and size. Description: Smooth black imitation silk. 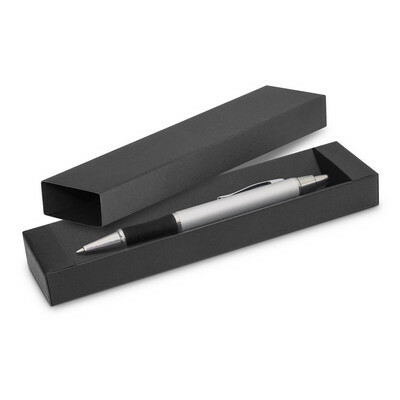 Features: Gift pen box with contrast stitching. Packaging: Polybag in a white sleeve. Packaging Size: 162mm(h) x 62mm(w) x 26mm(d). Colour: Black. Material: PU and PVC. Product Size: 160mm(w) x 62mm(h) x 26mm(d). Decoration: Pad Print. Decoration Area: Pad: 80mm(w) x 20mm(h). Description: For single pen in modern design. Features: Stylish cardboard box with super strong magnetic fold over grip suitable for a single pen. Packaging: White paper sleeve. Packaging Size: 186mm(h) x 65mm(w) x 26mm(d). Colour: Black and white. Material: Paper coated cardboard pen box. Product Size: 185mm(w) x 62mm(h) x 23mm(d). Decoration: Screen Print. Decoration Area: Screen: 60mm(w) x 30mm(h). Description: Stylish chrome tin with EVA form insert suitable for single pen. Engraves: Champagne. Packaging: Polybag. Colour: Silver. Material: Metal case with EVA insert. Product Size: 178mm(w) x 57mm(h). Decoration: Pad Print, Engrave. Decoration Area: Laser/Pad: 70mm(w) x 25mm(h). Description: Manufactured from gloss black material. Features: Metal badge, Pen box has a white velvet look interior with sash to hold pen. Packaging: White paper sleeve. Packaging Size: 50mm(h) x 180mm(w) x 35mm(d). Colour: Black. Product Size: Box: 179mm(w) x 48mm(h) x 35mm(d) - Badge size: 50mm(w) x 38mm(h). Decoration: Pad Print, Engrave. Decoration Area: On badge - Pad/Laser: 35mm(h) x 30mm(w), On either side of badge- Pad: 40mm(w) x 30mm(h).